Natt joins SAD: The SAD got a shot in the arm when former Weavco chairman Sukhjit Singh Natt left the Congress and joined the SAD with hundreds of his supporters in its fold. Deputy CM Sukhbir Singh Badal welcomed Natt and his supporters and expressed gratitude to them for acknowledging the gesture of the SAD and Chief Minister Parkash Singh Badal towards Punjab. Among others Jagdeep Singh Nakai, chief parliamentary secretary, and Harvinder Cheema, president, Arhtiya Association, Punjab, were also present. Broadcasting schedule for polls allotted: The Punjab Chief Electoral Officer on Sunday allotted a broadcasting schedule to various political parties through a draw of lots here. Representatives of political parties attended the draw, which was conducted in the presence of CEO Kusumjit Sidhu. For Prasar Bharti, 50 minutes have been allotted to the SAD on different dates, 5 minutes to the CPI, 5 minutes to the CPM, 5 minutes to the Congress, 10 minutes to the BSP and 5 minutes to the BJP. Broadcasting schedule for Doordarshan Kendra, Jalandhar is 51 minutes to the SAD, 10 minutes to the Congress, 5 minutes to the BJP, five minutes to the CPI and ten minutes to the BSP. Sher Singh Ghubaya to file nomination today: SAD candidate from Ferozepur parliamentary constituency, Sher Singh Ghubaya will file his nomination papers on Monday. While giving this information, Janmeja Singh Sekhon Irrigation Minister said that SAD president Sukhbir Singh Badal will accompany Ghubaya along with a galaxy of Akali leaders and party workers. Rail Mela held: The Rail Mela was organized here under the aegis of the Northern Railway Wives Welfare Association at the DRM Office complex which saw thousands converging onto the venue to enjoy the gala occasion. In the mela, various stalls were put up by the families of the railway officials which included stalls of Patiala suits, Moradabad brass items, Kullu shawls, Banarsi sarees, Kashmiri dry fruits sports goods from Jalandhar and Rajasthani handlooms. Commissioner, Ferozepur Division, B.S. Sudan and Satish Kumar, Divisional Railway Manager, Ferozepur division and other dignitaries were present on the occasion. The Mela organisers announced a grant of Rs 20,000 for the Arya Anathalaya out of the mela fund. Sena lashes at SAD, SGPC: Accusing the SAD and the SGPC of adopting “double standards”, the Shiv Sena has demanded that both responsible for the 1984 anti-Sikh riots and militancy in the state should be punished. In a statement here on Thursday, state publicity in charge of the Shiv Sena Jagdish Kataria said on the one hand the SAD and the SGPC wanted justice for anti-Sikh riots and on the other photos of some of the militants responsible for the killing of innocent persons in the state were being put up at religious places. Takkar to back Cong: The Shiromani Akali Dal (Haryana) headed by Kartar Singh Takkar has offered its support to the Congress in the Lok Sabha elections on Saturday. A meeting of the working committee of the party, which was organised in Ambala city, has passed a resolution in this regard. The senior leaders of the party, including Ranbir Singh Fauji, Jabir Singh Khalsa, Surat Singh Ratak, Manjeet Singh Karnal, Kanwaljeet Singh Ajnala, Harpal Singh Pali, Pyara Singh Layalpuri and Rajneet Singh Badhola, were present at the meeting. 5-yr-old boy killed: Vipin (5) was crushed to death by a speeding pickup vehicle in Phideri village, near here, on Saturday. The mishap occurred when the boy was reportedly playing near the roadside. The Sadar police here has registered a case under the Sections 279, 304-A of the IPC against the driver who fled soon after the incident. One hurt: Both arms of a farmer, Ram Bir, were chopped off after his arms abruptly got stuck into the threshing machine when he was reportedly pushing sheaves of wheat into the machine in Balawas Ahir village, near here, on Saturday. The critically injured farmer was admitted in a private hospital. Meanwhile, on a complaint filed by his brother, Bal Kishan, the Rampura police has registered a case of causing hurt by act endangering life under Section 338 of the IPC against the operator of the machine. Protest: Residents of the town backed by the District Kashtriya Sabha on Sunday protested outside the Gandhi Nagar police station against the inability of the police to arrest the seven youths, who had allegedly beaten a 65-year-old woman to death on Saturday. The protesters alleged that despite the fact that Parkasho Devi, a resident of Laxmi Garden, was brutally beaten to death, the police has failed to arrest the culprits. Suicide bid: A resident of Nukkar, Uttar Pardesh, Sunder, who was caught loitering in Sadhaura by the police, allegedly made an attempt to commit suicide here on Sunday. The incident took place when the police was taking him to produce before the SDM, Jagadari. While they were on the way, the police released Sunder for a while after he requested for answer a call of nature. However, Sunder allegedly jumped in front of a truck and sustained serious injuries. A case has been registered. JSM (P) backs Udey Chand: The Jammu State Morcha (Progressive) has extended support to Udey Chand, a candidate of the Duggar Pradesh Party (DPP), who is contesting elections from the Jammu-Poonch parliamentary seat. In a statement, president of the JSM (P) Prof Virender Gupta said the DPP also stood for their demand for separate state. “Udey Chand has unblemished image and has dedicated himself in the service of people of Jammu,” he said. He appealed the people of Jammu and Poonch to cast their vote in his favor. Play staged: 'Chandi Ka Chamcha', a play written by Habeeb Tanveer, was staged by artistes of Natrang Theatre here on Sunday. The play focuses on the life of a crowded city where sewerage is not functional due to blockades and no one is ready to take any initiative to get rid of the situation. Everyone is concerned about the sanitation of his respective homes and lanes are being virtually used as dustbins. A boy, who had just returned from England, tells residents about launching a cleanliness drive as adopted in the West. But nothing moves the people. Then, he flashes a news report, saying that he has seen some silver spoons flowing in the sewer lines. Every inhabitant starts searching lanes and sewer lines, clearing all filth in search of silver spoons. Book released: Shiekh Sajjad Hussain Poonchi's latest Urdu poetic collection "Faseelien Bolti Hain" was released at a function organised by the J&K Academy of Art, Culture and Languages at K L Saigal Hall here. A galaxy of writers, poets and prominent citizens were present. The book is a reflection of the sentiments of people residing in difficult and complex situations in the border areas of the state. Mahajan Sabha parivar milan: Mahajan Sabha Trikuta Nagar, celebrated the 119th birth anniversary of Justice Mehar Chand Mahajan and also organised Mahajan Parivar Milan function at Garden Estate, Trikuta Nagar, on Sunday. On the occasion, TR Gupta was the chief guest and the function was presided over by Yash Pal Gupta. According to the statement issued here, Jagmohan Gupta, chairman Reception Committee and chief patron of the sabha highlighted the activities undertaken by the sabha and revealed future programmes for the welfare and uplift of Biradri. TR Gupta and Yash Pal Gupta released the directory of Mahajan families of Trikuta Nagar. Haj pilgrims’ draw: The Doordarshan Kendra (DDK), Srinagar, is expected to telecast live the annual draw of lots for Haj pilgrims at Haj House in Bemina next week. An official of the kendra said: "The State Haj authorities have provided us tentative dates for live coverage on April 18 and 19”. The State Haj Committee for the first time decided to telecast live the draw of lots for Haj-2008 "for more transparency” and the event was widely appreciated". Soil-testing facilities: Chambal Fertilizers and Chemicals, a company of the A.K. Birla Group, has decided to provide soil-testing facilities to agriculturists and horticulturists, said MD Anil Kapoor during a meeting with business associates here on Saturday. Kapoor said his company had many diversification plans for the state. Saying that soil testing was imperative for increasing output and growth, Kapoor said: "The company would facilitate soil testing of various orchards in our high-tech laboratories located at Agra and Sri Ganganagar. This would ensure that fertilizers and pesticides are used in a proper manner". EVM training: The final phase of training in handling EVMs was imparted to the presiding and polling officers of all tehsils of this district here on Saturday. As many as 810 employees of Kalakote, Nowshera and Sunderbani were trained to operate EVMs. Rajouri DC Jaipal Singh said 454 polling stations were being set up in four assembly segments of Rajouri district for an electorate of 3,52,945. The elections for this parliamentary constituency are scheduled to be held on April 16. Plan to promote sports: With a view to developing sports in Leh district, the District Olympic Association will prepare a 15-year plan. The decision was taken at a meeting of the association held on Friday under the chairmanship of Deputy Commissioner AK Sahu, who is president of the association. This will help promote traditional as well as modern games that are popular played in Leh district. Sahu said the focus of the plan would be on traditional games of Ladakh which include archery, polo and ice hockey. The meeting also approved the calendar for this year. District and state-level championship in archery, fencing and table tennis will be held in the district. 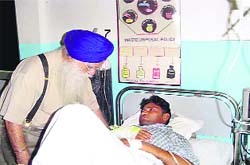 Budh Singh enquires after the health of a patient in Guru Nanak Mission hospital. Dr Budh Singh Dhahan visualised better health care, education for the underprivileged and empowerment of women. The octogenarian has been striving for it for 30 years. A sawmill worker-turned-construction tycoon Punjabi settled in Vancouver, Canada, Budh Singh returned to Punjab in 1979 to serve people in villages. He knew state of government-run health and educational institutions in villages of Doaba was far from satisfactory. He founded Guru Nanak Mission Medical and Educational Trust, Dhahan Kaleran (Nawanshahr),to serve villages through community-based health care, education and job creation. Motivated by him panchayats of Dhahan and Kaleran donated 30 acres. For health care and education infrastructure came donations. Dr Budh Singh visited the UK, Canada, the USA, Norway, Fiji and other countries to seek donations as 80 per cent of donations come from abroad. Money is collected through registered organisations. He has collected Rs 50 crore from abroad. Budh Singh’s (alias Babaji) initiative was modest but vision broader. Guru Nanak Mission Hospital with 15 beds was inaugurated in 1984 by BD Pandey then Governor of Punjab. This is the biggest NRI-funded charitable hospital in Punjab. The 250- bed hospital offers specialised medical services with more than 20 specialists and super-specialists on its staff. The hospital’s motto is world- class health care at low cost to all sections, especially villagers. In 1987, a senior secondary school was started by the Trust. The school has classes from nursery to class XII medical, non-medical, commerce and arts. Nearly 1,500 students from surrounding villages/towns receive education here. Guru Nanak School of Nursing (GNM diploma), first of its kind in the area , was set up in 1993 to train girls from villages in nursing . Nearly 600 girls have done GNM course from this school and are working in hospitals in India and abroad. In 1998 was inaugurated Guru Nanak College of Nursing. It offers four-year B.Sc. nursing degree. In 2008 post basic B.Sc. Nursing College was started. Madan Lal worked as motor mechanic and cleaner for two years in late 1940’s. He has authored 30 books in Sanskrit and Hindi. Dr Madan Lal Verma, a senior citizen of Kurukshetra, can look back with a sense of fulfilment. He did Prajna, Visharad (proficiency in Sanskrit), Sahitya Rattan, MA (Sanskrit), MA (Hindi) and Ph.D. (Hindi), as private candidate after marriage. He was first in Haryana to get first class first in M A (Hindi) as private candidate from Panjab University. Born in Tulamba village in Multan district (now in Pakistan) on May 16, 1931, Dr Verma has written novels, short stories, poetry, essays, and pieces of literary criticism . He was awarded Maharishi Valmiki Puraskar (2003-2004) (cash prize of Rs 1 lakh) by the Haryana Sanskrit Akademy for works in Sanskrit. Besides honours from several literary and social institutions he was conferred “Sahitya Saraswat by the Hindi Sahitya Sammelan Prayag. He retired as Head, Department of Sanskrit and Hindi, MD University Evening College, Rohtak. His works in Sanskrit and Hindi form the subjects of research. Kanpur University has awarded Ph.D. degree to Vibha Tiwari for evaluating Dr Verma’s Sanskrit novel, Rupa-Rupe (Form and Formlessness). Girikarnika, Uchhvasanam Pratichhaya and Vicharvithi in Sanskrit and Kanton se Bindha Gulab, Guzre Waqt ki Yaad and Nav Nimantran in Hindi are his other works. Six of his books, Vicharvithi, Girikarnika, Rupa-Rupe, Nav Nimantran, Pankhuriyon ke Swar and Sada Nira were published with grant from Haryana Sahitya Akademy while another six books, Uchhvasanam Pratichhaya, Kapisha, Pratichyam Dingmandalam, Avgahanam, Eko Apar Eklavya and Haryana Pradeshasya Panch Vishishta Sahityakara were published with Delhi Sanskrit Akademi’s grant. He recites his compositions at ‘ kavi’ sammelans. His writings were published in Vishwabharti Patrika, Nagri Pracharini Patrika, Parishodh, Hindustani, Samvad, Harigandha, Sapt Sindhu, Vishwa Jyoti, Sanskrit Vimarsha and Vishva Sanskritam etc.